Starburst and AGN, which are among the most active extragalactic phenomena, have been studied independently for many years. Recent observations reveal that many galaxies exhibit both AGN and starburst features, which naturally invites an investigation of their physical connection. Considerable new multi-wavelength observations during the last decade together with the results of many theoretical studies are enabling the physics and connectedness of these two phenomena to be understood more deeply. These proceedings are of a conference held at Shanghai Normal University, on a very pleasant campus southwest of the city. More than 120 participants from over 20 different countries were in attendance. The goals of the conference were to review past progress, present new results, plan future work, and establish observational and theoretical collaborations. We were treated to the first in-depth presentation of Spitzer Space Telescope mid- IR spectroscopy and imaging/photometry as well as new detailed theoretical modeling of the relationship and interaction between starbursts and AGN. Also presented were major new studies of the local universe from SDSS and other ground-based radio, IR/optical, and space-based x-ray observatories. 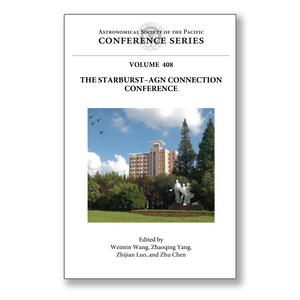 The importance of the intense starburst and AGN activity in the early universe only 1 billion years after the Big Bang is becoming evident from the very early formation of extremely massive galaxies and black holes. The coming together and cross-fertilization of these studies at the conference was most productive.